We run our Rafting and River Boarding trips an hour's drive away from Beitostølen. We drive together from our office in Beitostølen. We drive over Valdresflye which is a national tourist road and past the spectacular Gjendeosen with the famouse hike Besseggen.Please read more tourist road here: Valdresflye - Natsjonaleturistveier Our rafting trips are full day's activity and you are guaranteed an unforgettable experience and some spectacular nature. For those with waterproof cameras they can be brought along too as there will be opportunities to take photos. 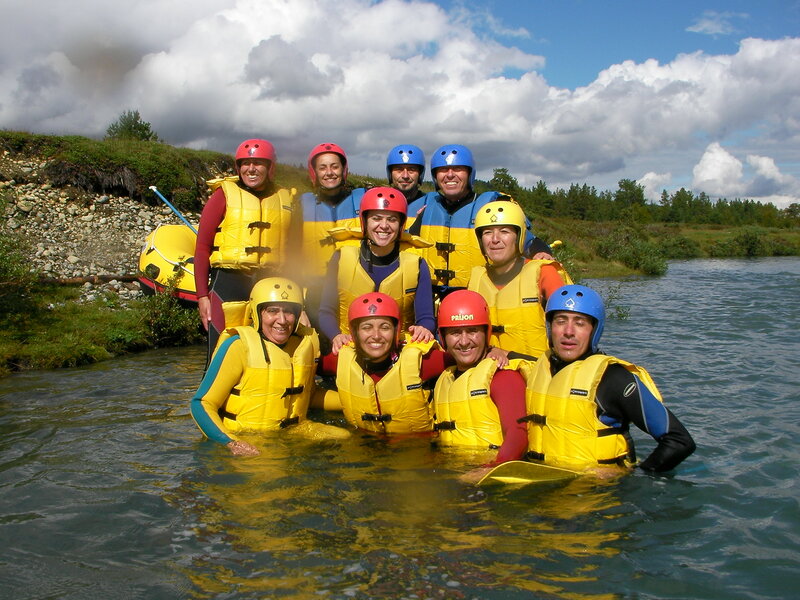 The tour does not require guests to have any previous rafting experience but all guests are required to know how to swim. The Rafting tours are a really nice nature experience out of the ordinary along with the drive to the river. We adapt the difficulty level to you and your group's liking, and we place a great emphasis on the social and fun aspects of the trips. There are different challenges that guests can experience on the trips, such as surfing the raft on a rapid, purposely flipping the boat, special rescue exercises and even the possibility of jumping into a plunge pool from a 5 or 12 meter drop. River Boarding in combination with Rafting is also an option. We have rafting for everyone! On this trip you will tackle the stronger rapids and experience plenty of white water action. This is the opportunity to challenge the river in full, but we still have the opportunity to customize the difficulty desired to both you and your group. The tour ends with the opportunity for cliff jumping in the beautiful and wild river Veo. To participate in this tour must be at least 10 years and have good swimming skills. Meeting Space: Beitostølen Aktiv & Ski School office (or by appointment). If raining: Trip goes ahead as planned. You will get wet anyway! Personal equipment you need to bring: Used sneakers, wool socks, thermal underwear, packed lunch, drink. Equipment you borrow from Beitostølen Aktiv: Life jacket, helmet, wetsuit.